The year is 1968 and the war in Vietnam provides a backdrop for the domestic struggle going on in Ashe's home. His mom is a peacenik who buys him "Hell no, we won't go" t-shirts, and his dad is a hawk who takes every word that drops from Walter Cronkite's mouth as gospel truth until the moment Cronkite suggests that America might want to retreat from the war. As the year progresses and Ashe's own views on the war start to solidify, events that are outside of his control threaten his future. This is a story about family, fear, love, growing up, and facing responsibility. That's a book you might want to read just based on the synopsis, right? Now, what if I told you the entire book is written as a series of haiku. 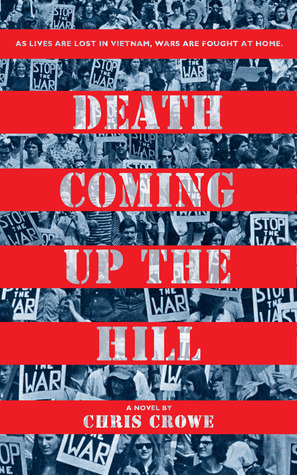 There are 16,592 syllables in Death Coming Up the Hill, one for each American killed in Vietnam in 1968. That might scare some readers, and if I'd known that was how the book was written before I got home with it, it might have scared me off. But these are not your average haiku. The book reads like a novel, and also like a beautiful poem. At one point, Crowe says that it's what's in the gaps that are important in Death Coming Up the Hill, and he does a great job telling the story while leaving gaps for us to fill in. I love literary fiction that experiments with form when it doesn't detract with from the narrative, and this form works to enhance the narrative. The book is a remarkable achievement, one that captures what it feels to be seventeen in 1968 (as my mother was), what it feels like to face a war, and what it feels like to be in a family that's falling apart. All in all, this is a beautiful, startling, sad, and immensely readable book. Captain William Monk of the London River Police and his deputy are on the Thames one night, enjoying the sunset and the view of a pleasure cruise boat when the boat suddenly bursts into flames, and Monk springs into action, rescuing as many survivors as possible. But when the night is over, nearly 200 people are dead. Within days, the case has been taken from Monk, and he smells a conspiracy that he, his wife Hester, and his disgraced friend Oliver Rathbone work to uncover. 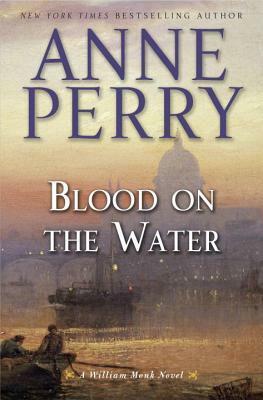 Initially, I thought that Blood on the Water did a nice job doing what so few sequels do well-- introducing the regular characters in a way that got new readers up to speed without bogging down the story for regular readers. However, as the story wore on, I found that I was so bored. Perry spends a lot of time with Monk and Hester, but not much time at all with the potential villains. The story quickly becomes bigger than just finding a bad guy, because there are many bad guys, but none she makes me care about. And I'm going to be a spoiler here, so don't read the rest of this if you want to read the book and be surprised, but it turns out that the major villains are people that dedicated William Monk fans already know-- they already care about them. But me? Not at all. And if I don't care much about the villain, and there's not a lot of character development going on for the heroes, then it's not a book I care much about.